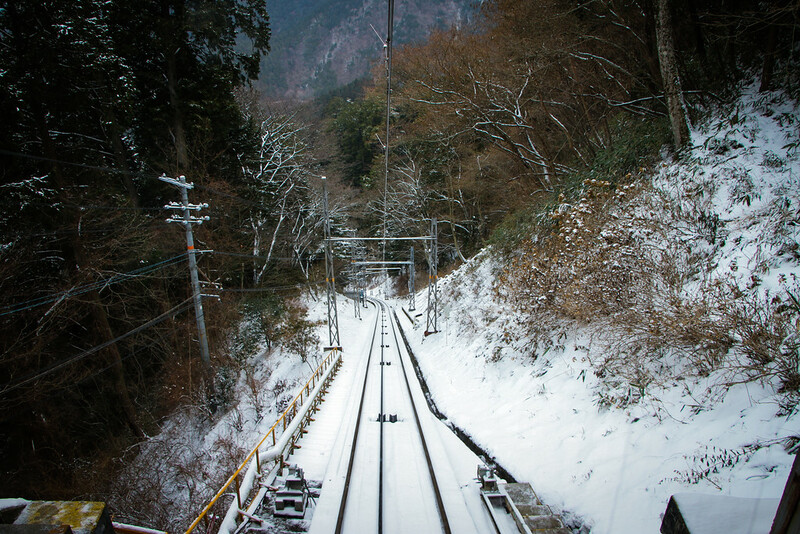 As the snow fell and the mercury dropped on the thermometers, we ascended the mountain on the steep funicular railway, its old gears and winches creaking and groaning as it dragged us to our destination. 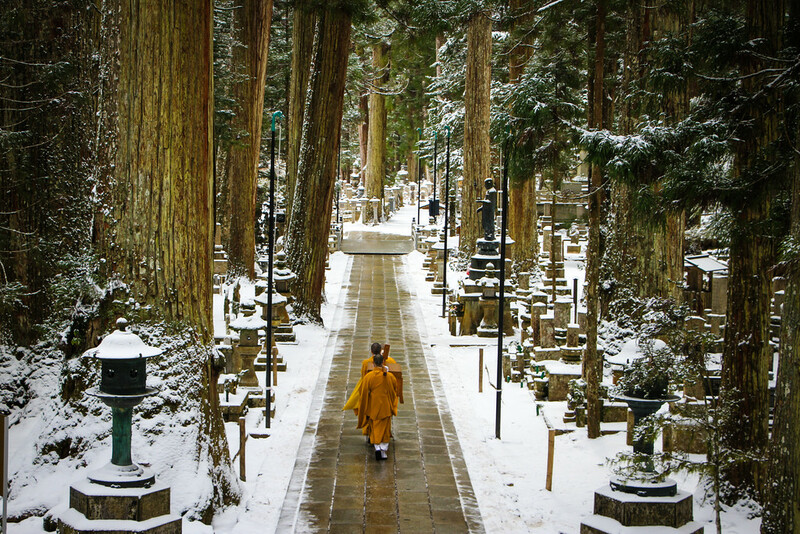 We were on the final leg of our journey to a temple retreat, nestled in the heart of the mountains near Koyasan, an area home to some of the most important religious sites in all of Japan and we’d arrived to a beautiful scene. Perfectly manicured trees perched delicately around a small pond, a layer of snow resting lightly on each branch. Above us, to our left, a large temple was only accessible by some steep stone steps, and to our right lay the entrance. The temple was beautiful. 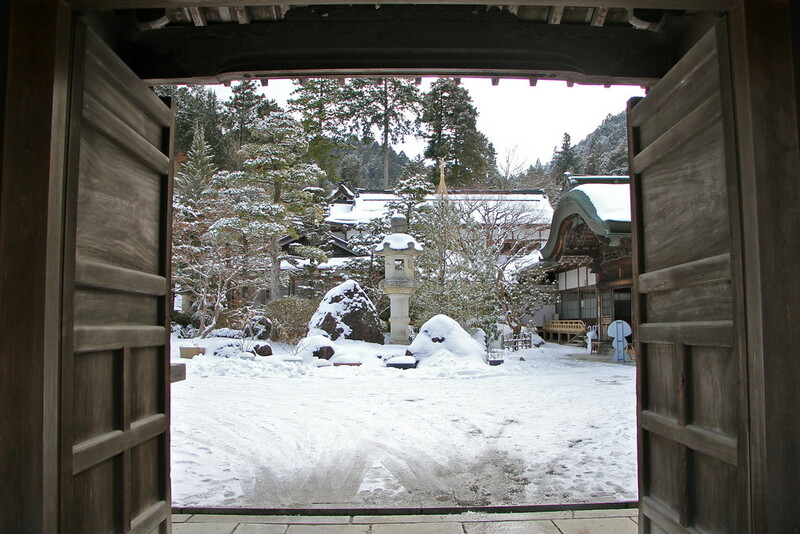 Inside, its wooden floorboards stretched out along perfectly straight corridors, flanked on either side by the thin white sliding doors to various ryokan accommodation. It was quiet, and it was cold. Our ryokan style room was simple and sparsely furnished, decorated lightly with tatami mats across the floor. A small table sat in the middle, adorned with a fresh flask of hot water, two cups, some green tea and two sweets. The room was ‘heated’ by a small kerosene heater, fighting a losing battle against the harsh conditions outside. The smell of kerosene was intoxicating. We’d chosen to spend a few days here to do, well, nothing really. And that was just as well, given the heavy snow falling outside, coating the temple and surrounding areas in a thick white blanket. We sipped our tea and requested another heater for the room to avoid having to wear all our clothes, all of the time. Our first morning required an early start, awakening before the sun rose to witness one of the ancient rituals carried out on a daily basis in the temple. This morning fire ritual turned out to be the highlight of our time in Koyasan. Throughout the ritual, each task was given fervent attention and focus, with every move purposeful and precise. From the blessing of the various instruments, to the careful and methodical building of the fire. Prayers were made for various people, the papers briefly exposed to the fire. The constant beating of a drum provided routine and rhythm to the ritual, and as the fire rose in front of us, finally began to warm us in the freezing dawn air. 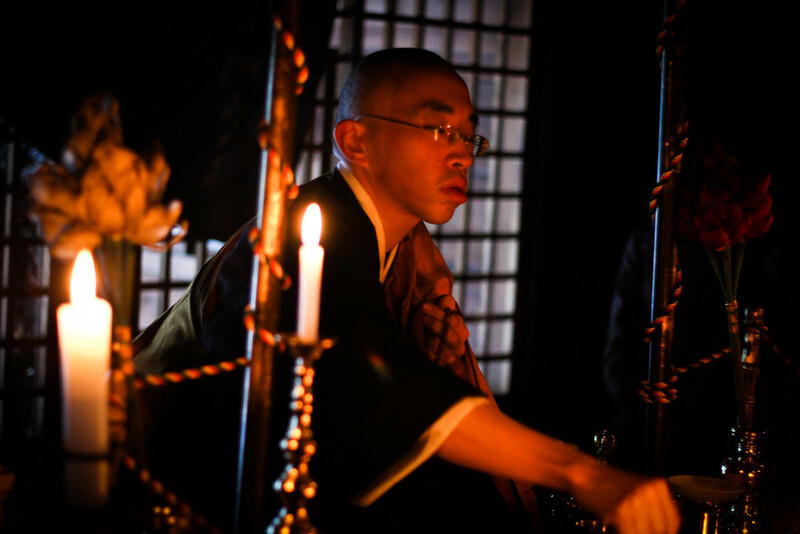 It was a fascinating insight into the lives of these monks. 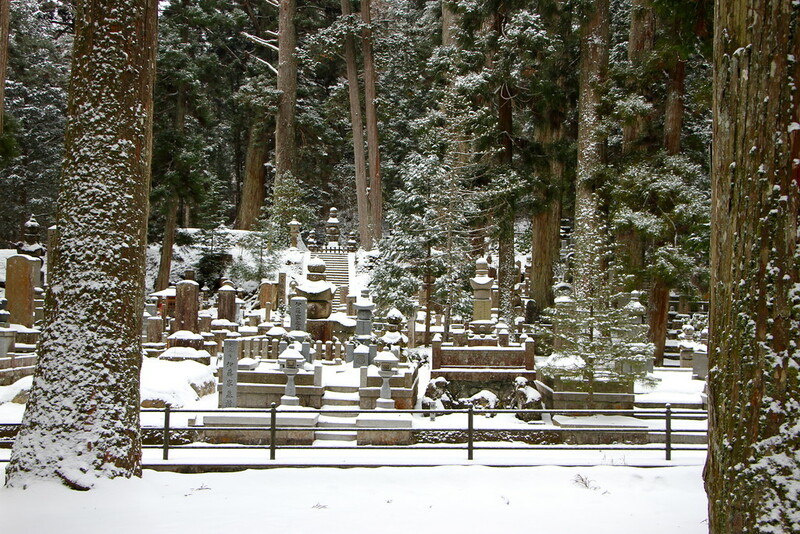 Warmed slightly from the fire ritual, we trudged through the snow to the nearby mausoleum of Okunoin, an important and respected religious site, where we wandered for a couple of hours through the 200,000 shrines, tombstones and temples as the snow once again fell on Koyasan. Seeking shelter in one of the many temples, we sat and watched a group of monks go about their daily rituals inside the temple. After spending time carefully and methodically closing a large wooden chest, it was taken outside into the cold air and quietly and solemnly taken away from the temple. As the snowstorm whipped up into a frenzy, we sought the shelter of a nearby soup restaurant, and the warmth of a hot bowl of ramen to reheat us. 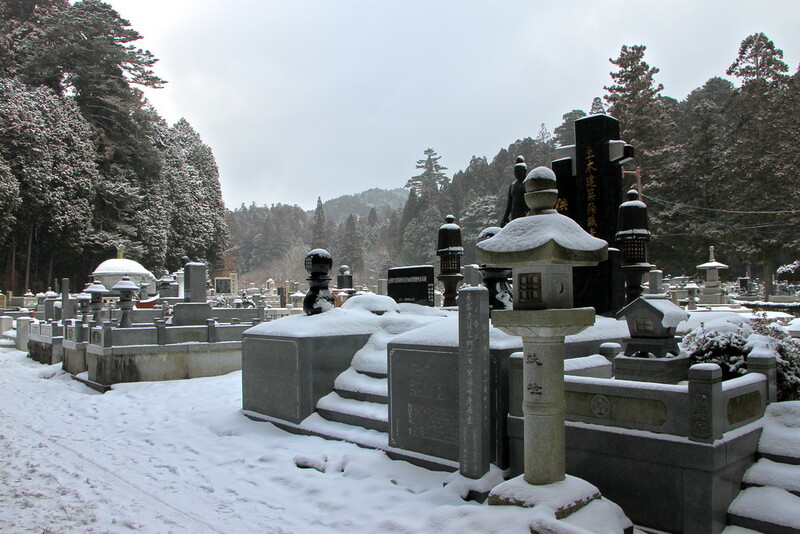 Koyasan was an intriguing experience, one we were glad to have sought out despite the freezing conditions. 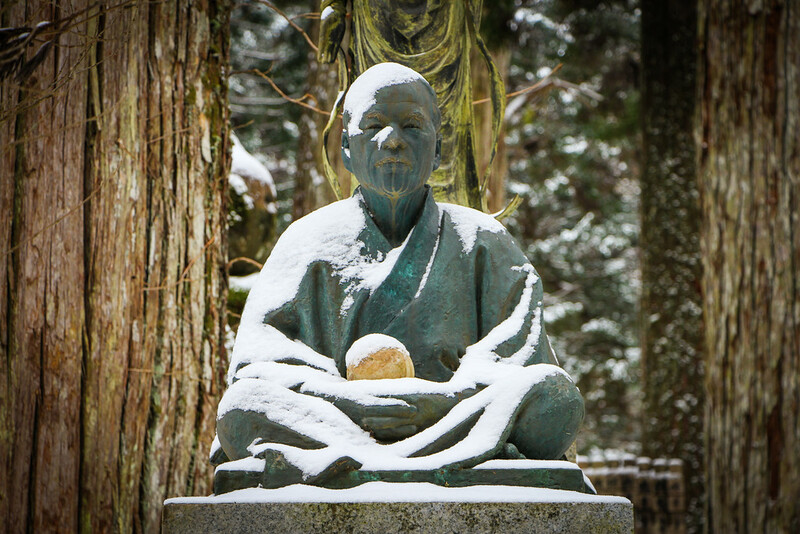 Sitting in quiet contemplation alongside monks in a temple in the mountains was something we had come to Japan to experience. As the mercury dropped once again into the night, our second heater arrived to fight the battle against the cold night, and we settled in for another evening of green tea and books. 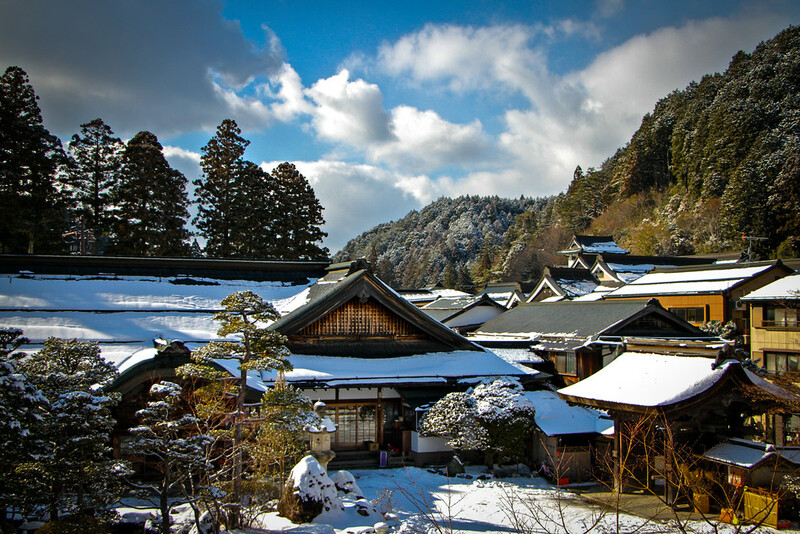 Looking for more Japan inspiration? Click here. Fasinating read – what a great adventure! It looks stunning and I’m sure it looks even more breathtaking in person. Great read, I’m currently planning a trip to Japan myself. This definitely looks like a very serene and scenic place. 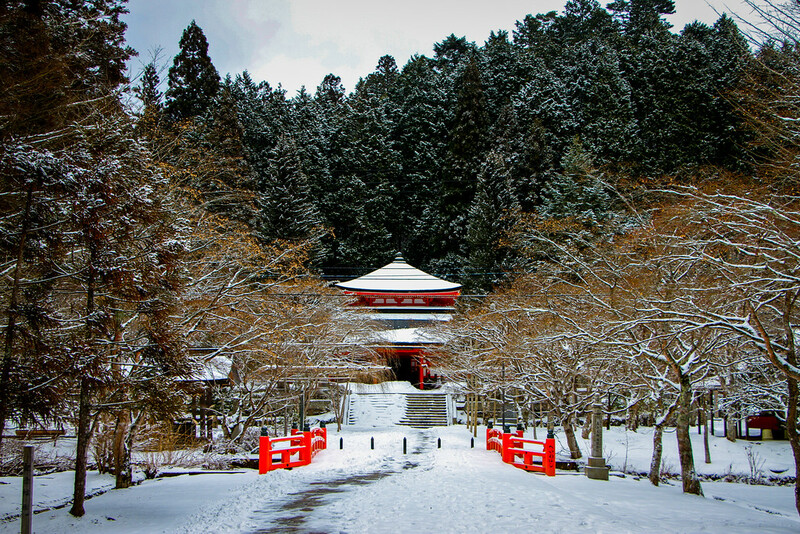 How’s Koyasan in late spring/summer (May – July)? It was very serene John! Weather should be much warmer then, it would be nice to see it without all the snow!